I am Marley is a one act play addressing the issue of transracial adoption. In this documentary style, student production we hear from Marley cast as five different people giving an insight into how she felt growing up as a black child with a white mother. We hear from the social workers placing the children and we understand that the whole issue is important but complicated. Written and directed by Aminata Mary Kamara the piece does well to tackle some ground breaking issues about the disintegration of black families and loss of positive father figures which have lead to black men producing children but not raising them. We hear from the social workers and the general public who equally don’t seem to understand the issue. We hear from the Marley who is happy and feels that her mother does well to accommodate her culture and heritage – cooking Nigerian food and even dressing her up as an African for dress up day at school. There were genuinely funny moments amongst the more hard-hitting questions about whether white people can really ever understand the needs of black people. As the audience is constantly reminded, “this is not a black and white issue.” And for a short piece, there lies the problem. With so many viewpoints aired in such a short piece – the message becomes difficult to grasp. It isn’t always clear that all five Marleys on stage represent the voices in her head – appearing to represent altogether different children. It’s no bad thing that the audience appeared completely immersed – if they were listening this hard Kamara’s message might just be heard. I also think it’s about creating a theatre, which reflects the multicultural society, we live in. There is still a deep inequality in the arts, as with many other industries, but it’s about creating an avenue for them to become a part of the production and process. Farhana Shaikh caught up with Aminata Kamara to find out more about her ambitions as a young theatre maker. Tell us a little about yourself and how you got involved in theatre? Theatre has always been my first love, and something that has been a part of my life since I was a child. My mum saw that from a very young age, I wanted to be at the forefront performing for others, so she always signed me on to drama after-school clubs. As an undergraduate, I began to become more aware of the theory behind performance and the importance of theoretical and academic research, in informing your performance and developing the quality of the piece itself. This inspired me more than anything to do a Masters in Drama, take a step back as a performer and focus on research into performance and the ways in which it can impact people in a number of different ways. What's been your most memorable night at the theatre? There have been a number of memorable performances that have helped to fuel my passion for theatre. But I believe the most memorable one was The Riots by Gillian Slovo which took place at the Tricycle Theatre in Kilburn, London November 2011. I was fascinated by the construction of the play, being taken from the words of real people, managed to bring insight into a matter that hadn’t yet been investigated by the government through a public enquiry. What inspired your play, I am Marley and can you tell us more about it? The play’s inspiration actually came from several conversations I had with a hair client of mine. She’s of African origin and told me she was adopted by a White couple, and having no prior knowledge of transracial adoption I was immediately intrigued by this unusual story and had asked her if I would be able to dramatize her story one day. Well, that day came pretty soon and as I continued researching more into the topic of transracial adoption, I realised what deep issues of identity, social policies etc. were tied to it. It was quite surprising to see how one person’s story, suddenly became the voice for so many more to be told. It was at that point that I felt a deep sense of responsibility in that light had to be shed on an issue, when in the past only specific voices and storied had been heard. I wanted to use performance as a vehicle that allowed the voice of adopted children, parents, and social workers to come to the forefront. What research did you do to make this play feel authentic? I gave one of my participants, the black female adopted by a white family, a video camera so she could start a two week video diary on her life. Then I interviewed her, as well as social workers, adoptive parents and a BME Arts Director within Leicester. I read some journal articles and literature on BME children in care and of those who had experienced transracial adoption. It asks the audience to think deeply, does culture matter, does heritage matter, can love conquer all. What message do you hope people will be left with? My hope is that people will firstly acknowledge what a beautiful tool drama and the arts are to present socially and individually relevant topics in a way that can engage people in current matters. Also, I would like people to realise that we have a responsibility for these children, that social change especially in the BME community must take place. I believe that social change is possible, but I also believe that social change will only happen when we chose to engage in a discussion about an issue and how we can progress to make improvements. What does bringing a production to stage involve - from writing to directing. Can you talk to me about the creative process you gone through and what's been happening behind the scenes, in the deep crevices of your mind? I have done extensive research into verbatim theatre and all the ethical issues it entailed, so I was very much aware of the process of constructing the script right down to the presentation of the piece through performance. However, once I started to audition people I thought it would be interesting to play around with the idea of having a cast that looked nothing like the interviewee’s in order to highlight even further the ways in which we may view race and identity. For example the ‘real Marley’ was a black girl, but I decided to use a variety of actors to play Marley, all of different races and ethnicities. I wanted the audience to ask themselves: is the issue of transracial adoption only an issue if the child is of Black heritage? Can a White person play the role of a Black person and if so what kind of an impact will that have? And also, how do we read into the context of words and language when a White person says the words that originally came from a Black person? This is just one example of how I wanted to approach verbatim theatre from a contemporary and insightful angle. My big dream is to have a successful drama company that aims to highlight the issues within society. I want to allow my life and my experiences to make a difference, challenge peoples understandings and hopefully cause people to not only ask questions but to find answers. Finally what do you think theatres can do to be more open and accessible to young BME audiences? I think it’s about educating young BME audiences on what theatre, drama and performance can offer them in terms of skills and opportunities i.e imparting confidence, raising self-esteem, and making them feel like an active part of their community. I also think it’s about creating a theatre which reflects the multicultural society we live in. There is still a deep inequality in the arts, as with many other industries, but it’s about creating an avenue for them to become a part of the production and process. Finally, I think theatres need to programme plays that are relevant to and engaging with young BME audiences, but this will only happen when the young BME community is approached and asked about what they would like to see at the theatre and how this can impact their lives. It’s about targeting these audiences with sincerity- good intentions, an open-mind and a willingness to listen to their opinions. 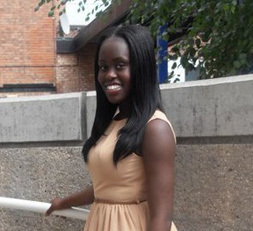 Aminata Mary Kamara is an MA Drama student at De Montfort University. I am Marley is her first production and was performed at the Y in Leicester on Tuesday 20th March.